We are very excited about the concerts we have lined up for you this year. Make sure to mark your calendars. Ryan Shupe and The Rubber Band-Being a 5th generation fiddler, an accomplished electric guitar, acoustic guitar and mandolin player, Shupe has been touring extensively across the US since he was 10 years old. He is no stranger to the national stage and the band has appeared on Good Morning America, E! TV, Mountain Stage, Woodsongs, GAC and CMT.They continue to tour regularly with stops at festivals, concert series, special events and prestigious venues. Bringing a national team together with radio, marketing, social media, and publicity, the band continues touring nationally. Jesse Thurgood- Jesse is a singer/songwriter with a smooth acoustic sound. He is the owner of his own independent record company, "Red Canyon Music," and has released five CDs under this label. Jesse's music, though hard to categorize, is influenced by folk, country-western and rock-and-roll, combined with his own life experiences. He creates an honest expression written and performed straight from his heart. 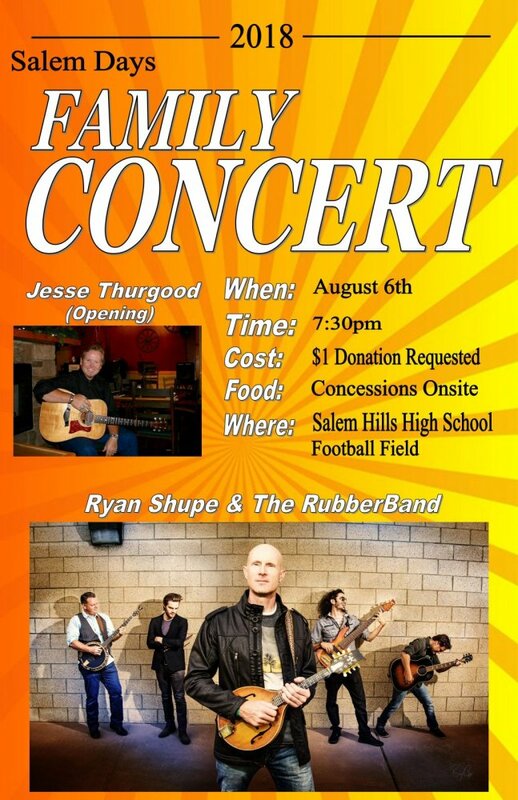 This concert will be held at the SHHS Football Field and will begin at 7:30pm. Concessions provided by the SHHS Volleyball Team and other snack options available. A $1 donation/person is requested.